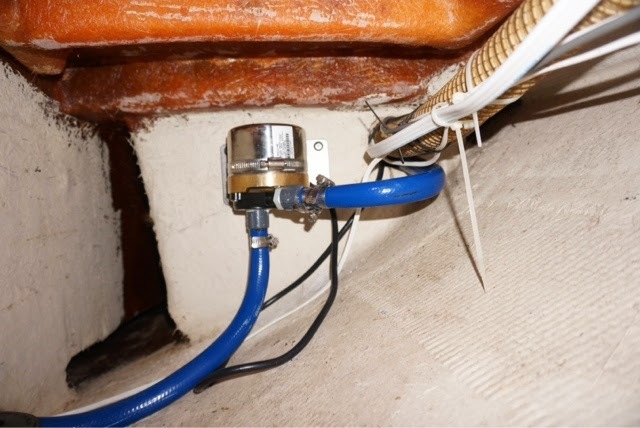 As summer approaches and more people consider installing air-conditioning in their vessels, I thought it might be time to re-post this write-up from our old blog that didn’t get migrated to the new site. The unit has indeed been a great investment and worked flawlessly for the past year. It took four weekends, but Gimme Shelter now has marine heat and air-conditioning. 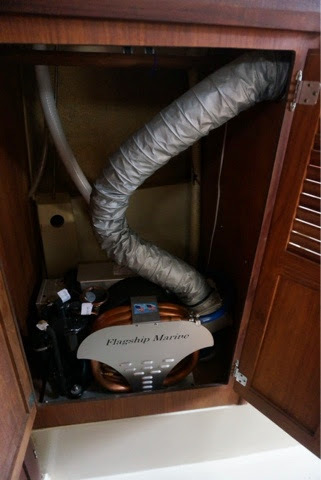 We went with a Flagship Marine 12000 BTU unit as we liked both the fact that the units are made in the USA and they use a modular off-the-shelf construction, so should anything go wrong, it’s easy to find parts. 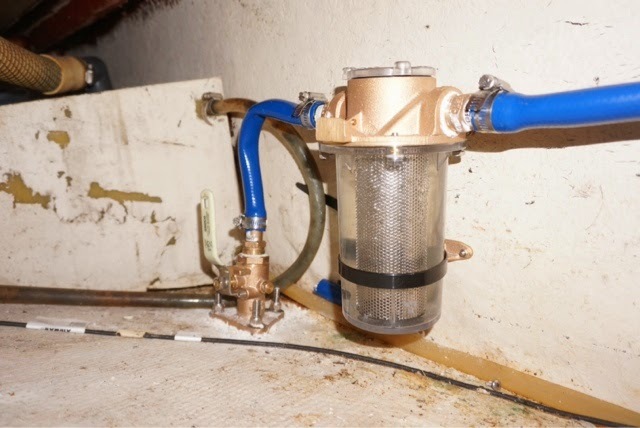 We ordered both the unit and the deluxe installation kit, so it came with the appropriate through-hulls, ducting, hoses, vents, pump and strainer. We weren’t completely thrilled to be giving up the closet, but getting rid of the space heater and the roll-around air-conditioner that were taking up space in the cabin made it a worthwhile tradeoff. It was also the easiest place to duct. 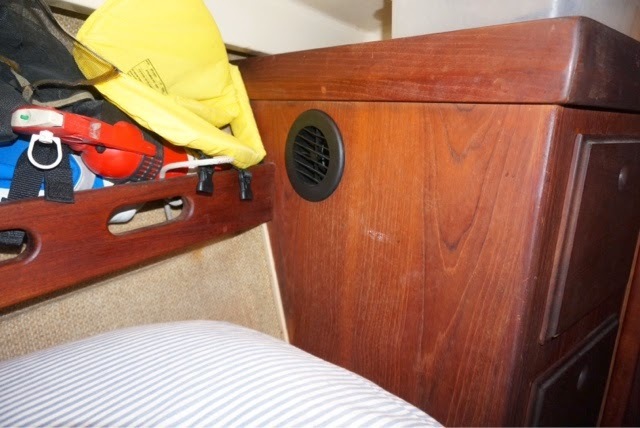 We simply had to run one duct through the bulkhead into the main cabin and one out through the bottom of the closet and back up into the bukhead of the v-berth. 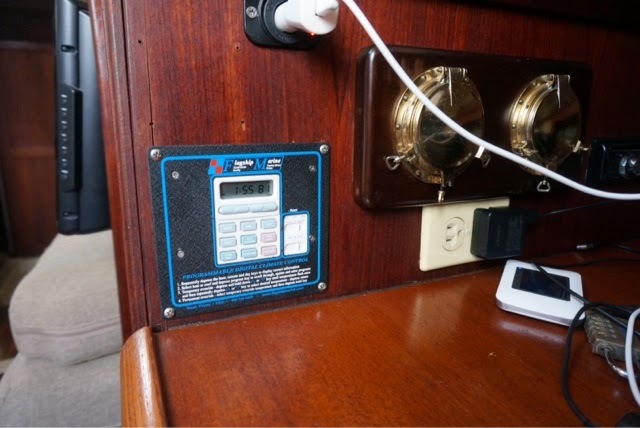 We installed the programmable thermostat in the nav station. Of course, to run the air-conditioner we had to install a new 20 amp breaker. Unfortunately the O’day panel only had three breakers: outlets, charger, and water heater. We took a trip to West Marine only to find out breaker panels are REALLY expensive. We decided go browse through the Kemah Boaters Resale Shop. Jackpot! Yes, we had to install it sideways. And yes, we still had to spend $65 to replace two of the breakers, which ended up different colors. 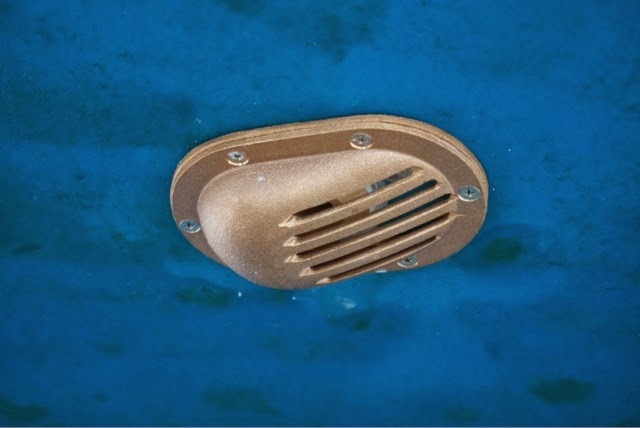 However, the panel was only $8.99, and we didn’t have to cut up the bulkhead. It turned out to be a good thing we pulled the old panel out. The cable going to the outlets was in really bad shape. 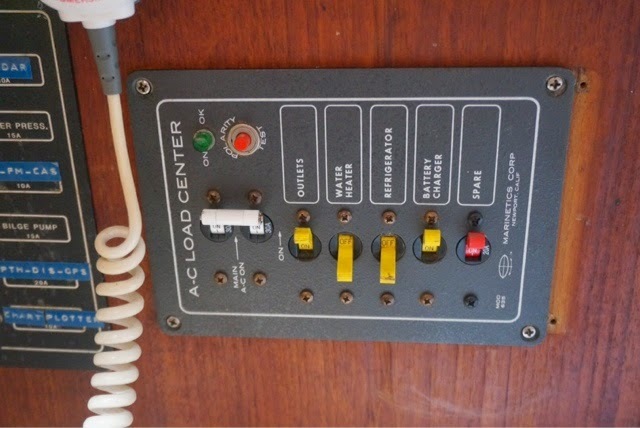 The plastic casing of the 30 amp breaker on the panel also shattered when I attempted to unscrew the shore power leads. I guess it’s good to inspect your electric lines every 32 years. 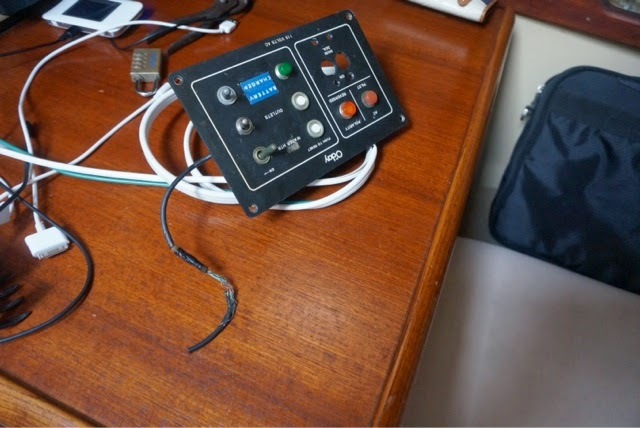 After three weekends of drilling holes, running cables, and re-wiring breakers, we came to the one thing we couldn’t do ourselves — drilling the through-hull. We fired up Gimme Shelter and puttered around the corner to South Texas Yacht Services to have them drill a hole in the bottom of our boat. 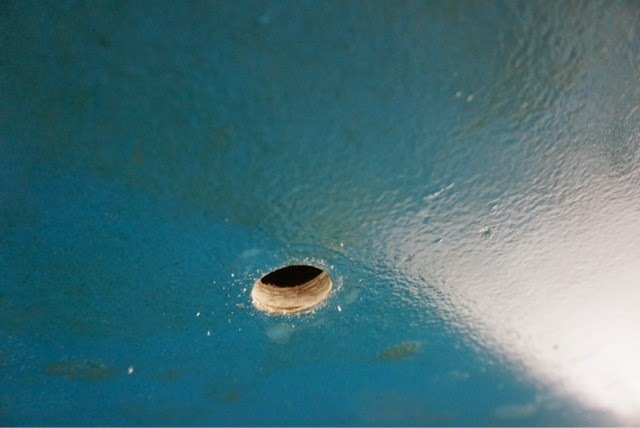 I had one friend who swore to me that we could drill a hole in the water as long as we had a bunch of rags to shove in the hole while we fished the through-hull through the bottom with a string. I decided it was worth it to pay for a haul out. 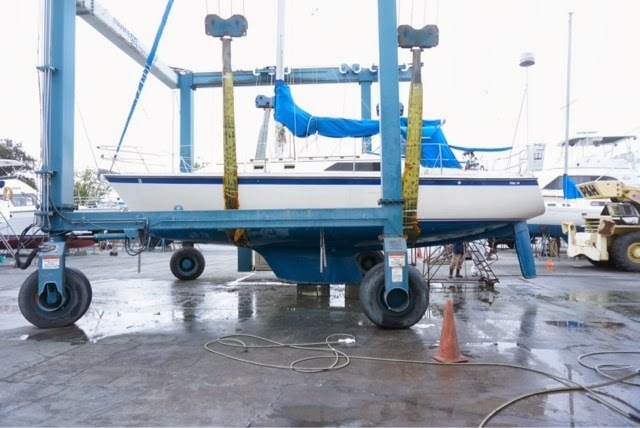 Quick hauls generally last one hour, but when they install a through hull they want to give it a little time for the sealant to cure, so you basically get charged for two quick hauls. 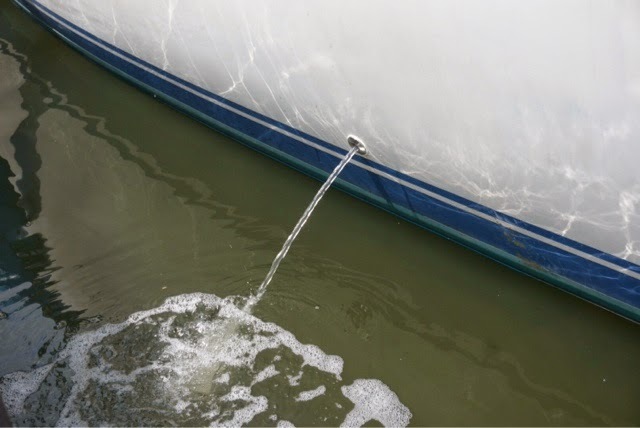 All in all, our “extended quick haul,” pressure wash, zinc change and through-hull installation cost us $650. It added a lot to the cost of our air-conditioner installation, but not sinking at the dock was worth it. 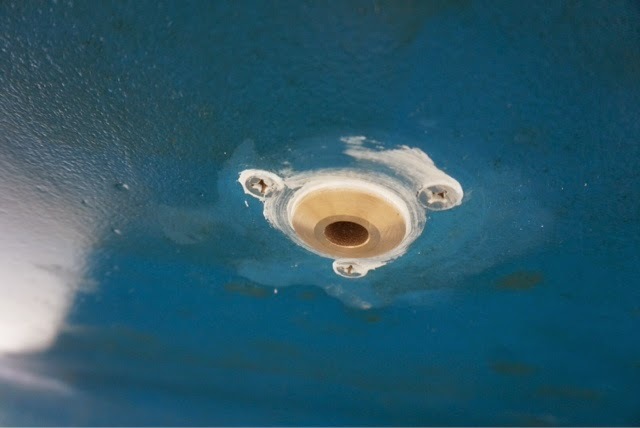 We were back in our slip with the professionally installed through-hull and a clean bottom by 10:30 a.m., so I went to work installing the strainer and pump. The heavy duty blue silicone hose was a nightmare to get onto the flanges. I finally boiled a pot of water and stuck the ends of the hoses in the water for about 15 minutes to get them flexible enough to install. They are so tight, I’m pretty sure the clamps aren’t even necessary. The pump had plastic flanges and was much easier to install. I opened the through-hull, kicked the thermostat over to “Cool”, and checked our water flow. No more lifting window units on and off the deck and leaving them on the dock. 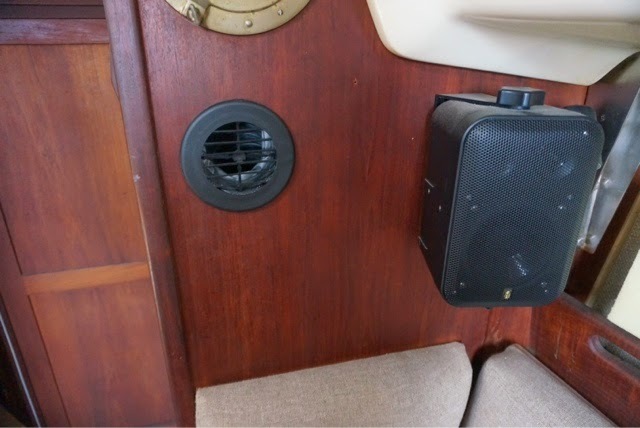 No more crappy roll-around units dumping condensation all over the floor and having to be lashed up against the wall when we go sailing, No more space heaters in the walkway causing us to worry about starting a fire. Will it be worth the investment? I sure hope so, but I guess we’ll find out this summer. YES, It was totally worth the investment! Fabulous info and great blog you shared here.